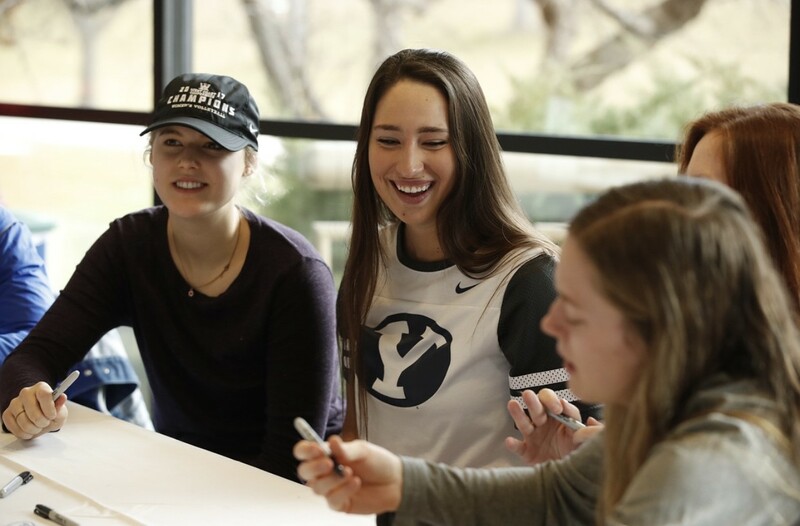 Ten female BYU sports teams gathered to showcase the positive role athletics can play for young girls on Saturday, Feb. 3. Participating teams included gymnastics, volleyball, soccer, lacrosse, rugby, cheer, cross country, track and field, the Cougarettes and tennis. The event took place at the Marriott Center prior to the women’s basketball game against Gonzaga. It recognized National Girls and Women in Sports Day, which is celebrated today, Feb. 7. National Girls and Women in Sports Day celebrates fair play, awareness of female athletic opportunities and Title IX. BYU celebrated the event by giving community members a chance for face to face interaction with female athletes in a game-day atmosphere. 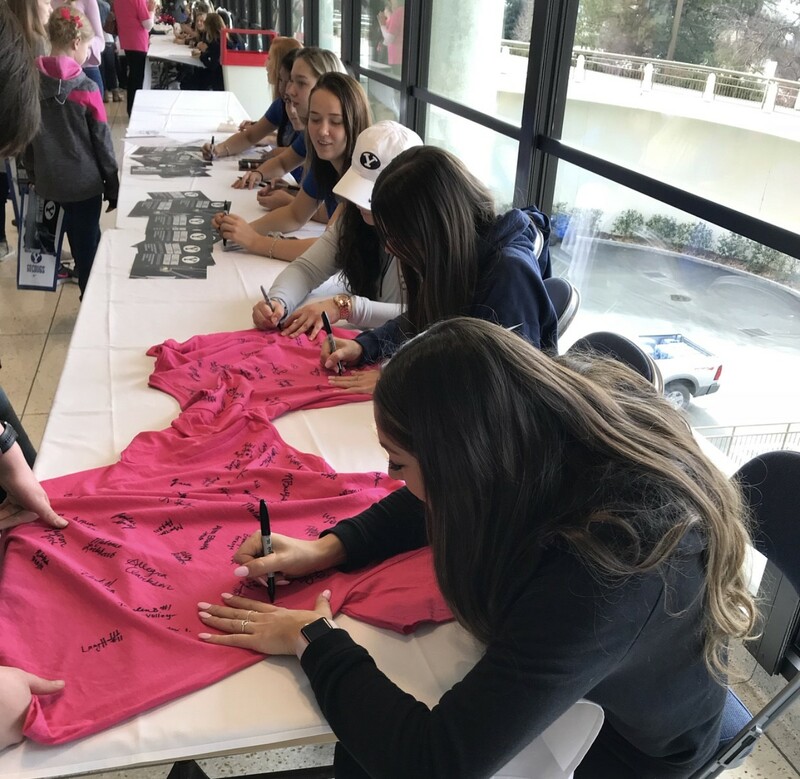 Girls of all ages received autographed posters sporting the National Girls & Women in Sports logo and pink game-day T-shirts. Female student athletes greeted the participants and signed autographs. 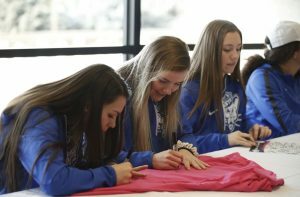 Shaylie Fawcett, director of BYU’s National Girls and Women in Sports Day, said about 1,000 people participated — even more than last year — and she hopes the event continues to grow each year. 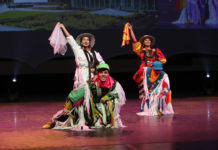 Each team was encouraged to provide flyers, posters and swag. 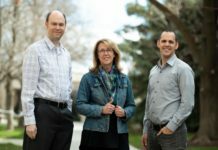 Women in Business, BYU Sports Camps, the Title IX Office, Women’s Services, Sports Marketing and Social Media also had booths to support and show young girls ways to be involved besides playing, Fawcett said. Fawcett said this event has a strong impact on both the athletes and those who attend — athletes see the difference they can make in the community, while girls who attend see they can be involved in sports. Darger also commented on this impact. “Our athletes take it seriously because they remember looking up as little girls, and now they are paying it forward,” Darger said. Assistant Cheer Coach Jaime Ogle, a former BYU cheerleader, said she remembers looking up to her older sister who cheered before her and wanted to follow in her footsteps. Watching her sister do hard things and seeing her opportunities as an athlete inspired her, Ogle said. Ogle added she was grateful to have participated in athletics at BYU, specifically cheer. “Cheer is a special portion of BYU’s female athletics because we get to be part of all the different sports and be here to support our women’s teams,” Ogle said. The event continued through the women’s basketball game; various timeouts gave young female athletes and event participants opportunities to use their athletic abilities. Two young basketball teams scrimmaged at halftime, and others participated in a handstand contest during a quarter break. Darger said the day is important because of the lessons learned through participating in athletics. She said confidence, teamwork and learning to work hard are all taught through athletics. More information can be found on the National Girls & Women in Sports Day website.